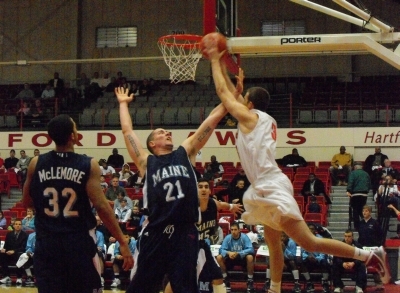 Men’s Basketball: Maine tops Hartford 77-69 in 3 point filled game. WEST HARTFORD, CT- Head Coach Ted Woodward led his Maine Black Bears into Chase Family Arena on the UHart campus, looking to continue the team’s winning streak at the expense of Dan Leibovitz’s Hartford Hawks. His team would succeed by narrowly despite what the final score reported. The game would be a shootout with each side sending their 3 point shooters into the fray and it at times three point shots were all that were being taken. Hartford’s Ross Erickson opened the game scoring up by hitting a 3. Maine’s Sean McNally responded with a 2, the Hawks’ Morgan Sabia hit from beyond the arc to make the score 6-2. Maine’s Troy Barnies had 2. Soon afterward, Milton Burton picked up the offensive rebound on a missed 3 and put 2 in, and Sabia added a jumper after that to take a 10-4 lead. But Gerald McLemore returned fire with his first three pointer of the day. Joel Barkers scored an open jumper for U of H to keep the lead at 5. After a time out at 13:48 play resumed and McLemore hit another 3. U of M’s Murphy Burnatowski stole the ball from a Hawk and Terrance Mitchell attempted a 3 for the Black Bears, only he was fouled. He made all 3 free throws to take Maine’s first lead of the game 12-13. Teammate Andrew Rogers hit a three as well even though he was covered and the lead was 4. A time out soon followed. Hartford’s Burton responded with a 3 of his own, but McLemore hit yet another and the score was 15-19. Rogers was followed on a drive and made both free throws to add to the lead, but Joe Zeglinski got his first three for the Hawks to cut the lead back to 3. Burnatowski ended up with the ball with guess what, a three point shot, 18-24. Barkers went for a basket but was followed, he made 1 of the shots. Maine went on the attack and Malachi Peay spun inside and got it into the basket. Two points came the ‘Bears way. Hartford broke the scoring streak when a pass went to Kevin Estes under the net and he easily scored two. A pair of Hartford fouls and a time out later it was 29-23 with McNally at the line. He hit one and missed one, but soon afterward McLemore hit yet another 3 and the lead was 10. Hartford was looking a bit rougher at this point including a pass out of bounds. To add insult to injury, McLemore hit another 3, his fifth of the quarter. Hartford called an understandable time out. The Hawks attempted two threes and were unsuccessful but Maine didn’t score either, and eventually Barkers went in and was fouled. He hit both three throws and the game was 36-24 Maine. McLemore then used an open opportunity to score another 3 as if this was unexpected. Burton drove for 2, though Maine scored 2 right back. With 3:47 in the 1st it was 41-27 Maine. Hartford had the ball briefly before the ‘Bears stole it. Junior Bernal went coast to coast for 2. When the second half opened, Sabia picked up a rebound and the ball went to Zeglinski, he hit an open 3 to cut the lead to 8. Maine took another shot, Hartford rebounded. Barkers went for the net and scored with the foul. He missed the shot however, but not long after he scored 2 more over the defenders. The score moved to 43-39 Maine and with their lead shrinking the Black Bears took a time out. U of M’s first points of the half came when Bernal went over the D for 2. Barkers got a pass from Burton for an open jumper and the score was 45-41. There was a lot of back and forth, but eventually a foul on Hartford resulted in two more points. A Hartford steal got the ball into Zeglinski’s hands again and he hit the 3 to regain the lead 46-45 and that’s how the score would be at the 14:39 mark in the 2nd. But Mike Allison had been fouled by a Hawk before the TO and hit two free throws, though, Barkers regained the lead right back. Allison hooking over the defense. Hartford missed a 3, but Maine rebounded, and McLemore scored only two points, a rarity for him on the day. Anthony Minor went for 2 for the Hawks to cut the lead, but McLemore while shooting a 3 was fouled and he hit all three free throws. Zeglinski struck again with his own three ball, and the score was 53-54, each side had their attempts, but no more scoring came before the 10:42 mark. There were more shot attempts, and two fouls by Hartford starting giving Maine some shots which they hit. But Sabia hit a three from the side of the net and the score was 56-56. A foul on Mitchell gave him two shots which he nailed, but Sabia was fouled and he hit two as well. The score was 58-58 with 8 to play. Minor than stole the ball and Sabia received it hitting another 3 from the side. McLemore did what he was doing all day, and put up his own 3 to tie the game up. At 7:01 it was 61-61. Hartford struck next when Zeglinski fed Minor and he delivered the slam. Maine’s Terrance Mitchell aired out a long 3. U of H set up for their response, but Mitchell dived for the ball stealing it, though in the process he knocked it out of play. Hartford now with the ball again had a time out at 5:28 to help set up. They didn’t score however, and instead Mitchell scored 2. Sabia however was disinterested in allowing that lead to build and he hit another 3. Mitchell however successfully launched his own 3 even with a Hawk in his face at the time. Mitchell fed Bernal on a break to extend the lead to 71-66 with over 3 to play. A foul put Zeglinski at the line and he missed the 1 in 1 attempt. However, the ball returned to his hands not too long after that and he nailed the 3. The score was 71-69. A foul on Maine put them at the line and they hit one. Barkers was fouled but both shots missed the net. Time was rapidly running out and Mitchell was fouled. He hit 2 and the lead was 74-69 with :33 seconds. Hartford couldn’t score a hurried 3, and McLemore was fouled as Maine went for a basket. He hit one and it was 69-75. With the game pretty much out of reach Maine would score two more on foul shots as well. Thus ended a hard fought basketball battle where the three point shot and free throws really played a critical role in its outcome.